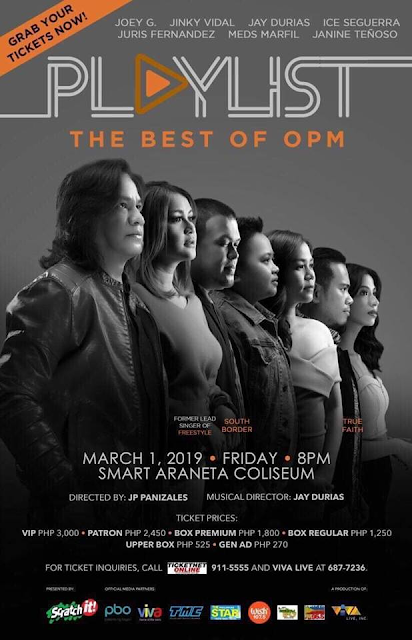 Refresh your soul by going back to your favorite Best OPM band on March 1, 2019 at the Smart Araneta Coliseum, Playlist 'The Best of OPM'. Seven of the best hitmakers will collaborate in one stage to serenade you with a heart-warming songs from the 80's that for sure has been part of your life romantic journey. Watch out for Joey Generoso(Side A), Jay Durias (Southborder), Jinky Vidal (Freestyle), Ice Seguerra, Juris Fernadez (MYMP), Meds Marfil (True Faith) and Janine Teñoso. Tickets are available at www.ticketnet.com.ph.